Whale & Jazz Festival is jazz festival held in Gualala, California North Coast, California. This is held during the Smithsonian Institute's Jazz Appreciation Month of April. The event promotes and educates us about the whales. 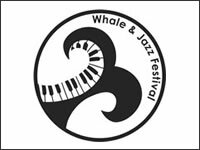 (Whale Education Program) Jazz music permeating the air, as well as, art, film, poetry, wine, and restaurants throughout the area.